Ontario will scrap the province’s cap-and-trade program and pull out of the carbon-trading market with Quebec and California even as pollution pricing expands in other regions of the world. Ontario’s Progressive Conservatives will follow through on a campaign promise to withdraw from the environmental program that required companies to buy credits to offset pollution blamed for global warming. Premier-designate Doug Ford also said he will challenge Prime Minister Justin Trudeau’s authority to make local governments put a price on greenhouse-gas emissions. The move comes as carbon-pricing programs are expanding in the U.S. even as President Donald Trump seeks to ease restrictions on coal companies. Europe already has a large regional cap-and-trade system while China, the world’s biggest polluter, has committed to a national pollution program that could open by 2020. Phil Murphy, who replaced Chris Christie as New Jersey governor, has pledged to rejoin the nine-state Regional Greenhouse Gas Initiative led by New York. Virginia has taken steps to link to the RGGI program while lawmakers in Oregon are debating a carbon-pricing program. Ontario’s election results were largely priced into California’s carbon market. Despite Friday’s announcement, emitters in Ontario remain obligated to manage their carbon pollution until the province formally withdraws from the system, said John Battaglia, head of carbon markets at BGC Environmental Brokerage Services LP. Ontario’s PCs will be sworn in June 29 after defeating the Liberals in an election earlier this month. Ending what Ford called a job-killing carbon tax was one of his major commitments during the campaign. Ontario will also quit the Western Climate Initiative, Ford said Friday from Toronto. 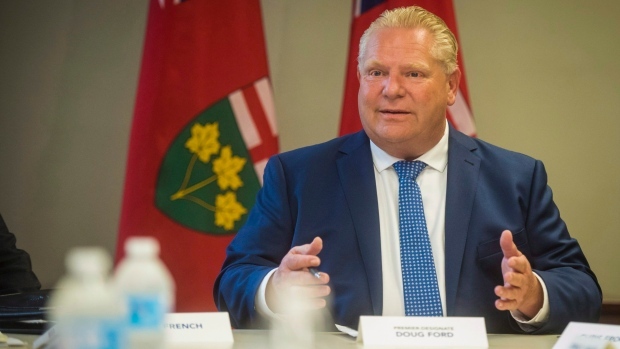 “Eliminating the carbon tax and cap-and-trade is the right thing to do and is a key component in our plan to bring your gas prices down by 10 cents per liter,” Ford said in a statement. But the move may not spare Ontario from a carbon price. Trudeau’s government is bringing in carbon pricing rules to cover all provinces and a “backstop” for local governments that don’t come up with their own plans this year. Climate change is real and its impacts don’t stop with a change in government, Caroline Theriault, a spokeswoman for Canada’s Environment and Climate Change Minister Catherine McKenna, said by email. The federal government also has “clear” jurisdiction to apply a federal pollution price if Ontario changes its system, she said.